based on religious beliefs continues. gay, bisexual, transgender, and transsexual community. "LGB" refers to the first three. "On my honor I will do my best." "I believe that the Boy Scouts of America does a wonderful service for this country. I support the right of the Boy Scouts of America to decide what it wants to do on that issue. I feel that all people should be able to participate in the Boy Scouts regardless of their sexual orientation." Mitt Romney, while debating with Ted Kennedy in the Massachusetts senate race of 1994. "The Boy Scouts of America maintain that no member can grow into the best kind of citizen without recognizing his obligation to God." Bylaws, Boy Scouts of America. "Any organization could profit from a 10-year-old member with enough strength of character to refuse to swear falsely." Editorial, New York Times, 1993-DEC-12, commenting on the Boy Scouts' exclusion of a young Atheist who refused to lie about his religious beliefs in order to be accepted into a BSA troop. "...the Boy Scouts of America have been brutally assailed as malicious monsters because they believe that only adults who adhere to a moral code should lead young boys." Jerry Falwell 3 (He seems to have implied that a person cannot be moral without first believing in God). "When religion sanctifies hatred, it lends to that hatred a special ferocity. Normal moral inhibitors are erased." Johannes Cardinal Wildebrands. 2013-MAY: Delegates to the BSA National Annual Meeting voted to allow gay and bisexual children and youths to join and to remain in the BSA, but only until their 18th birthday. 2015-AUG: The BSA started to allow gay and bisexual adults to join as scout leaders. 2017-FEB: A troop within the BSA expelled a member because he was a transgender boy, then later welcomed him back. The BSA later started to allow transgender boys to join. These are youth who were identified as female at birth but now identify as being male, or as having no gender, or as having both a male and female gender. 2017-OCT: The BSA announced that it will shortly allow young girls to join as Cub Scouts. As of 2018-MAY: There does not appear to be any movement towards admitting boy members or adult leaders who do not affirm belief in God, including Agnostics, Atheists, Secular Humanists, some Unitarian Universalists, some Wiccans, some other Neopagans, etc. 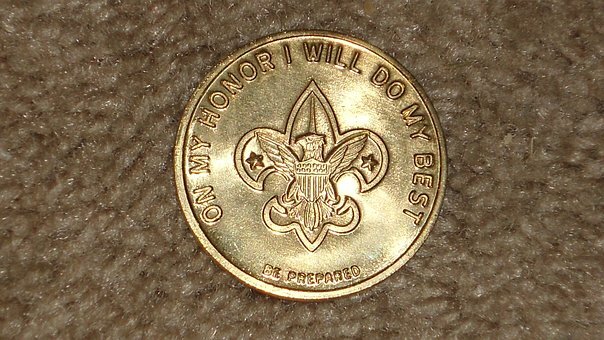 who are unwilling to recite the "belief in God" clause in the Scout Oath. As of 2019-FEB: The BSA is expected to admit female members of all ages to the Scouts. At the same time, they will drop "Boy" from "Boy Scouts of America," and start using the name "Scouts BSA." Part 1: Overview Of The BSA. The BSA's history and foundational beliefs. Part 2: BSA's beliefs (Continued). Membership oaths. Intolerant & tolerant policies. Part 3: BSA's tolerant policies (Continued). Shift in the U.S. culture, and the BSA's response to allow gay and bisexual members. Part 6: Discrimination against Atheists etc. (Continued). Part 2: Trail Life member restrictions (Cont'd). Is it a threat to the Boy Scouts of America? The following information sources were used to prepare and update the above essay. The hyperlink is not necessarily still active today. Jerry Falwell, "The New Racism," Falwell Confidential, 2001-AUG-30. Robert Baden-Powell, "Scouting for Boys," Original edition, (1908; reprinted 2014 by Dover Books, 2014) Available in Kindle and Paperback formats, with different cover images. Read reviews or order this book safely from Amazon.com online book store"
"Boy Scouts of America: Handbook for Boys," First edition (1911; reprinted 2005 by Dover Books). Available in Kindle, Paperback and Hardcover formats. Read reviews or order this book safely from Amazon.com online book store. Copyright © 1999 to 2017 by Ontario Consultants on Religious Tolerance.